From Pillows to Potholders, Throw Blankets to Curtains; the list of Home Accessories is endless. Let your home accessory designs stand out by creating a series of custom labels to meet your branding needs. Logo, Content and Warnings Labels. PVC, Printed or Woven Labels. As Large or as Small as you need it. Why do my Home Accessories need Professional Labels? The reasons for labeling your home accessories are numerous. One of the most important reasons is to help you develop brand recognition and providing customers with a way to order from you. How else will they know what you create and offer for sale? Imagine owning a bakery and you have a custom box or ribbon made just for your cupcakes. Without a label letting clients know how to find you and your products, they will think you just sell cupcakes. Custom branding is how they will know you also make wedding cakes, cookies or artisan breads! Your label should definitely promote your business. Customers need to know how to find you to see what else you make and sell. It also might be a legal requirement to note the materials used in your creations. Basically, most things we sit on, lay on, or otherwise used to provide comfort, may have legal label requirements based on the state you come from. This is something you can easily look up as most of the requirements are available online. Why should I get custom labels? Is it clear to your customers who designed and created the item they are buying? Do Your customers know how to reach you and see what else I have available for them? Do You want them to be able to refer me to their friends and guests who may comment on my design? If you answered yes to any or all of those questions then you need a professionally designed custom label. Should I order one label for all of my items? With Woven Labels being the number one way to set yourself apart from the competition, we suggest and encourage you to brand everything you make with a custom label. We understand that not all accessories are created equally, so sometimes a variation is needed for your label to work on a series of unique designs. This is where we can come into the picture and help you decide what is best for each item. Often the same label can work, but on some surfaces we need to add adhesive backing or iron on backing. Possibly the same logo and design is needed for towels as well as for curtains or upholstery covers. We may suggest anything from a woven label for one item to a soft PVC label with the same design for another item. This is not a problem for our design teams and creators. Let us help you decide the best way to approach your line of products and keep it cohesive and at the top of the quality and professional category. Do I really need Custom Labels? If you work this hard to create a unique item and design, don’t you want everyone who appreciates the end products to know who did it? Of course! Are you ready to know more about custom woven labels, please visit our custom woven labels webpage. 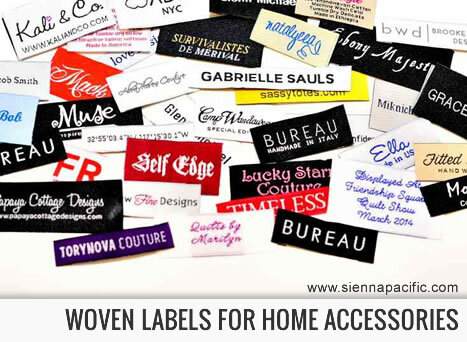 There are many examples of pet labels in our woven damask label picture galleries as well. If you are ready to start designing your label; please give us a call or start fill out our Quote Request form and we will get you started.